You can keep linens, small appliances, books, and household items in beautiful wicker baskets. 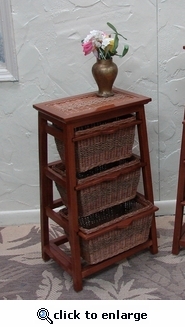 Each hand-woven natural wicker basket drawer easily slides out the hardwood Pyramid Stand. Each basket is easy to carry. Pecan finish.